Rumours circulating on Facebook about a sensational auction on eBay for a lost Colin McCahon painting which sold for a mere fraction of its worth back in 2006 have been confirmed by people close to the story today - but the mystery of how the painting returned to NZ remains. 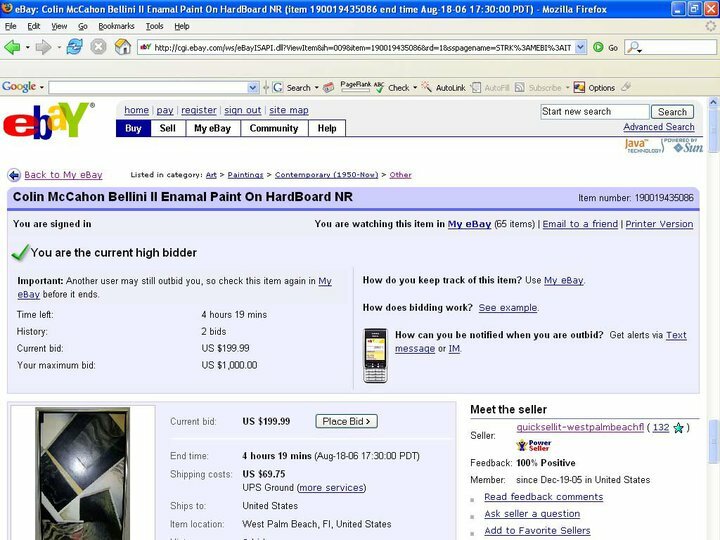 Shown here is a screenshot from the auction on eBay "Colin McCahon Bellini II Enamel Paint on Hardboard No Reserve" with bidding at a mere $US199.99 just four hours before it closed with a winning bid of just $US 4500 - approx $NZ6500 today. 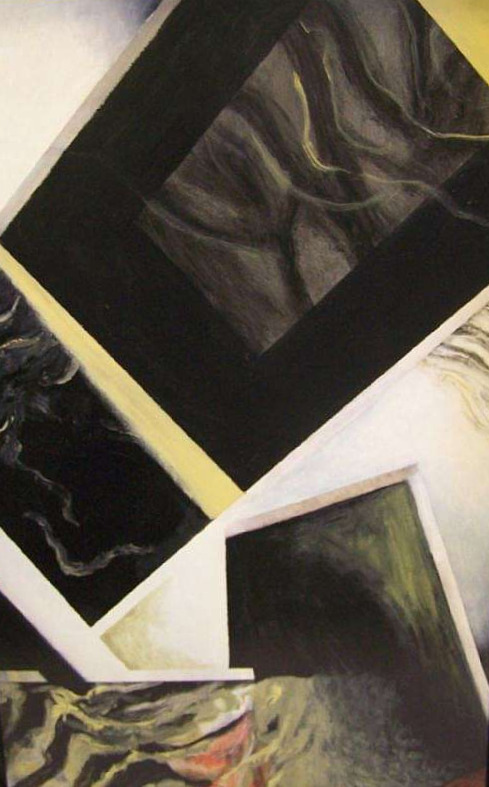 This is the deal of the decade for a NZ painting considering Colin McCahon currently holds the record sale price for a painting by a NZ artist with a top price paid of just over $1.1 million (for Let Be, Let Be in 2009). However the excitement didn't stop when the auction closed as the vendor refused to hand over the painting to the auction winner - Auckland tribal artifact collector Andrew Pendergrast. 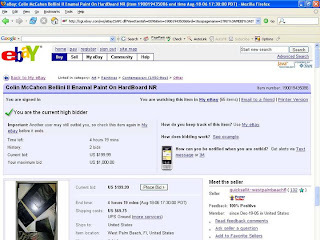 Pendergrast claims "someone must have offered [the broker listing the painting on behalf of the vendor] some cash to disclose the vendor's name" because despite the vendor's agent being forced to refund $1000 in currency conversion fees and Pendergrast significantly increasing his offer "no matter what I offered the vendor had uplifted the painting from the broker and there was nothing I could do to change his mind". Mike Weston, of Auckland pop art studio Weston Frizzell, who today admitted via email to being the unsuccessful underbidder on the auction would not say how he first heard of the auction but said he "watched for a few days and it seemed to have gone un-noticed - I couldn't sleep". Weston inadvertently got locked out of the auction at the last minute due to bidding an auto bid amount over the unregistered buyer limit - "If I'd bid only $10k [instead of $50k] I would have got it" says Weston ruefully. The painting, shown here at right, is one of Colin McCahon's Bellini series, and almost certainly from the group of 19 paintings purchased by the American collector Edward Danziger from Auckland's Ikon Gallery in the early 1960s. According to McCahon expert Martin Browne who tracked down Edward Danzinger in the 1990s there was "definitely at least one missing Bellini Madonna painting" even after Brown's time-consuming detective work managed to reveal the whereabouts of two more Bellini Madonna paintings along with at least another half a dozen McCahon artworks that had previously been part of Danzinger's collection. Although Browne would have to sight the painting in the flesh to confirm his view on its authenticity he says that there was a painting referred to as "The Second Bellini Madonna, 1961" shown in Contemporary New Zealand Painting at the Auckland Art Gallery in November December 1961 and "there seems a good chance that the eBay one may be it". According to Browne in all probability "someone got themselves a bargain". Prominent New Zealand dealers and galleries approached for comment would not say if the painting had been purchased by them, one Auckland dealer summed up their collective response - if it were them "that would be confidential information" which they would not divulge. Please leave a comment below or call the writer at New Zealand Prints if you can help solve the mystery of who was the successful purchaser and how they managed to get this long lost Colin McCahon painting back to NZ. It is not a McCahon. I sold the original 19 paintings to Edward J Danziger. If it was one of the Bellini paintings it has been "improved" by some unknown hand. None of the works to the best of my knowledge was painted on hardboard. Further the mccahon site displays the other bellini madonnas and they are all on hardboard. So Don Woods knowledge and recollection are not supported by the facts available.